This chess game balance article describes chess balance, chess values and includes a valuation table. It is part 5 followed by part 6: Checkers. This advanced article is designed for chess players who want to learn more than simply basic playing techniques. A table of simplest values in chess was devised long ago, and l refer to Leonhard Euler, a mathematician and evaluation of true values. The list below shows the worth of pieces based on degree of movement. 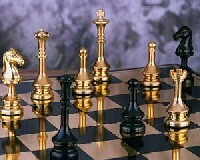 This reasoning does not apply to the promotion of a Pawn, and the Pawn therefore gains in value at the end game stage. Apart from this factor, Leonhard Euler method is sound, and the values he developed agreed with those based on experience. R = Kt + 2 P's. Q = 2 Rs = 3 Kts. K = Kt + P.
But this table is only the beginning of the work of valuation. Whether a player is considering upon abandoning some chess values in order to gain an advantage he/she has to compare what he/she intends to give up with what he/she hopes to gain. A frequently occurring instance is the sacrifice of a pawn for advantages gained in game play. What advantage in development maintains the chess game balance for the loss of a Pawn? Perhaps no master has ever been able to give a fully satisfying answer to this question, though a good deal of chess strategy depends upon it. 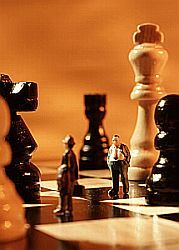 The experienced player answers the question by weighing the issues of the position and letting his judgment decide. A good method for creating and training your decision-making is to experiment with advantages and sacrifices to produce a chess game balance. Let a player, for instance, figure out which of the two minor pieces, Kt and B, is in a given case the stronger or more valuable piece. To that end, and adopting a balanced approach he will set up a balanced position, and see by trail an error, which side gets the advantage. If he varies chess game balance position in pieces and weaknesses, the continued exercise will at length develop his judgment for the distinction between Kt and B to a fine point. Let the student begin with simple tasks of this kind before he attacks the more complicated ones. The influence of the Q over the White pieces, firmly positioned though they are, and the nature of the advantage that she holds is, for the rest, quite clear. The conception of chess balance often called (according to the great Chess thinker and Master, William Steinitz) “Balance of position” is more important than it would appear above. Chess is too restricted a concept to give a full meaning to that conception. The values that are essential to chess, although many, are not so nicely graded as to form a continual series, therefore a perfectly balanced position does not exist in chess. In a symmetrical position, the move would make a difference, though in practice that might amount to very little, and the game therefore might easily end in a draw. All the same, the position would not correspond to the conditions of a perfect chess balance. Let us for the moment forget that we study chess and let us imagine what the conception of chess game balance is. 1. In a balanced position, neither side is able to gain an advantage by force. 2. In a balanced position, any attempt to win an advantage, however well planned, may have to be abandoned. 3. In a nearly balanced position any attack, however well planned and intended to obtain a considerable advantage, can be stopped and even though the attacked army may be weaker than the attacker, he can still protect his pieces and even mount a worthwhile attack. The difficulty in any abstract reasoning on chess is mainly its lack of grading in the final result. Loss, Draw or Win. This is the scale of success in chess. Now the concept of an “Approximate Balance” may be used in chess, even by the perfectionist chess player. The greater force will gain the greater advantage. It is sufficiently clear that three modes of game play are possible in chess. First is Attack, which concentrates effort on one or more weaknesses in the opponents camp with the intention of forcing the opponent to defend, and finally to gain an advantage. Second, Defense, which obstructs the efforts of the enemy or concentrates efforts on its own weaknesses, or shifts these weaknesses, or makes some sacrifice to reduce the severity of a major onslaught. Third, Development, which does not concentrate effort, but spreads it, to gain in movement in readiness to attack or to defend. A move that does no good in any one of these ways is usually a wasted one. The main reason for attack is to maximize its chances. The attack has to gain the utmost advantage of which it is capable. The main reason for Defense is to minimize its risks of losing its most important pieces. The defense must make the smallest sacrifice that is possible to ward of the attack. The main reason for Development is to win in the shortest time possible. The development should be as rapid as possible, so that the state of readiness should be reached after as few moves as possible. They will lose many games by attempting it regardless, but if they shrug it off to experience and analyze their failures, in the end they will attain levels that they could never dream they could reach in the beginning. The above principle is applicable to all board games and to much else. The method deserves to be widely known. I call it the method of values. This is part 5 of 6 of the Chess Glossary + Checkers.